A Bed and Breakfast on the Island of Put-in-Bay. Five to ten minute walk to most attractions. Ask about Access to Pools. 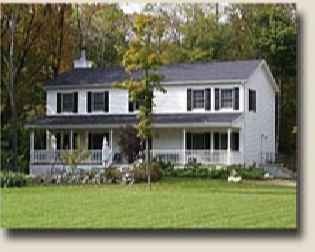 A PutinBay, Ohio, Bed and Breakfast, centrally located in a quiet area on Langram Rd. (Airport Rd. ), Just a 10 minute walk or less to downtown Put-in-Bay, the caves, winery, family fun center and churches. Explore Put-in-Bay by renting one of our (3) four-passenger electric golf carts. The Bed and Breakfast is fully air-conditioned , and has four comfortable rooms, each with a king-size or a queen-size bed. All have private baths. Relax on the large front porch or brick patio. Take a nap in our two-person hammock. We are a couples only Bed and Breakfast (however we do take ice fisherman in winter). Continental breakfast is in the common room from 8am to 10am. The B&B has complimentary fruit, soft drinks, and cookies available throughout the day. You may store your own beverages and snacks in the refrigerator. Rates are shown per room per night. Starting May 5th there is a 2 night minimum on weekends. 2 or more days save $10 per day. $30 + tax per weekend. $10 + tax per day (noon to noon). Rooms $90 + 4% tax per day. stay both days save $10 per day. $50 + tax per weekend. $10 + tax per day (noon to noon). Rooms $115 + 4% tax per day. $85 + tax per weekend. + 4% tax per day. $100 + tax for 2 day weekend. $95 + tax per weekend. $105 + tax per weekend. $60 + tax per weekend. $45 + tax per weekend. Rooms $110 + 4% tax per day. Transportation to the bed and breakfast is easy. First you cross Lake Erie to South Bass Island (PutinBay, Ohio) by Miller Ferry Boat, Jet Express, airplane, air boat, or private boat. If you take one of Miller Boat Line’s many ferry boats from Catawba Island, Ohio, you can cross Lake Erie to Put-in-Bay, Ohio, in only 18 minutes. Then get on the bus, and ask the bus driver to drop you off at the Niagara Guest House B & B. It is a quick trip, and the bus costs only $3.00 per person. If the bus is not running in the early spring or late fall, you can take a taxi for $2 to $4 per person. The price of the taxi is posted on the outside of the taxi. If you take the Jet Express from Port Clinton, Ohio, you will cross Lake Erie to South Bass Island and arrive in downtown Put-in-Bay, Ohio, in about 25 minutes. From the Jet Express dock it is a 10 minute walk to the bed and breakfast, or a $2 to $4 per person taxi ride. We also have Toledo House. It is just a 3 or 4 minute walk from the Jet Express and across the street from the depot for the buses that come from Miller Boat Line. These lodgings are a 2 to 5 minute walk to downtown Put in Bay, Perry International Peace Memorial and Visitor Center, night life, dining, and more, yet still located in a quiet area.